The hills are alive… with the sound of music! While you won’t encounter many locals raving about this classic Rodgers & Hammerstein musical, the vast majority of tourists to Salzburg will be. Growing up with a mom who is absolutely enamored by the musical retelling of the Von Trapp family story, I’ve always dreamed of seeing the places from that timeless and classic film. The backdrop of many in-town shots, this castle is the iconic backdrop of beautiful Salzburg. This ancient fortress, along with the city center or Residenzplatz, is seen during the song “I Have Confidence”. 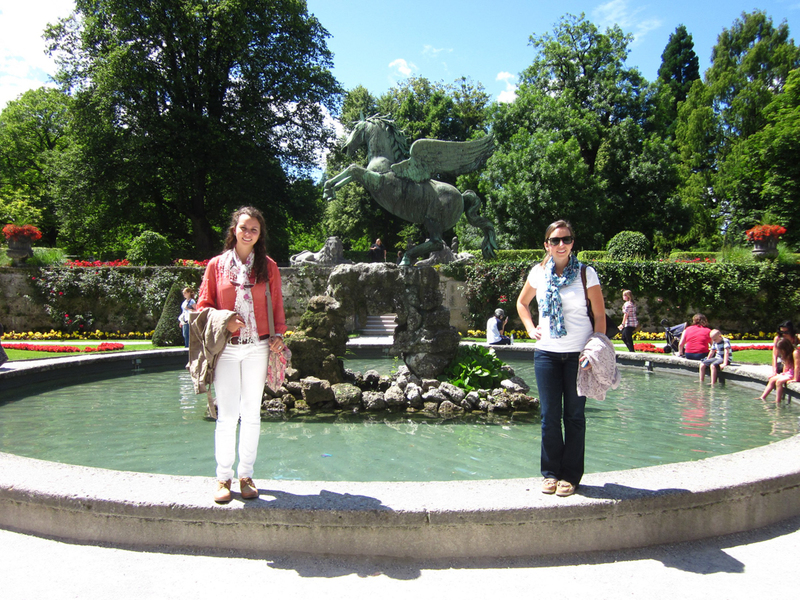 If you want to imitate Maria, be sure to splash your hand in the Residenz Fountain! 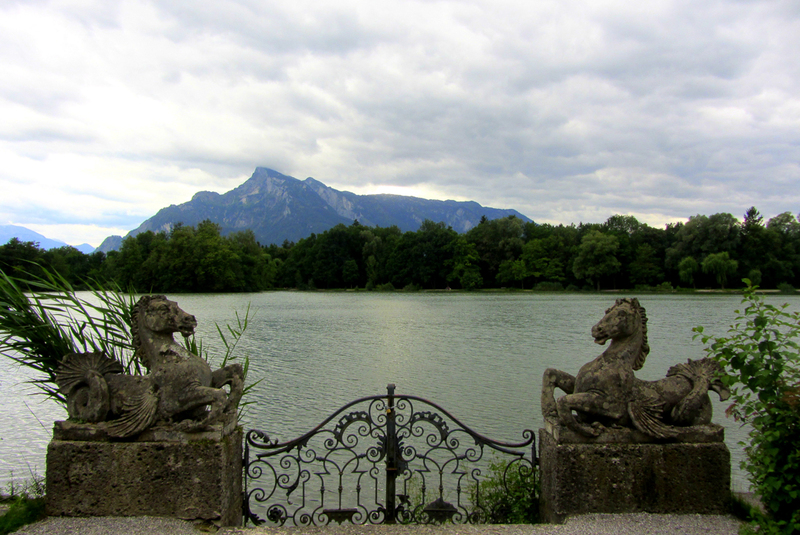 At the time of my visit, the general public was unable to be on the grounds to get this view of the Von Trapp family’s backyard and lake. How did I do it? I was fortunate enough to have a mom that did her research! If you stay at the Schloss Leopoldskron Hotel, it’s all accessible! We spent two nights there, and so had this bit of Hollywood history all to ourselves! This was probably my favorite part of our visit, and really did make us feel like we were inside the film. Additionally, inside this palatial yellow colored estate, there is a room that inspired the gilded ballroom seen in the film. It is the one featured during the “Lonely Goatherd” and “So Long, Farewell” scenes. Schloss Frohnburg is a beautiful 17th century home, and is where they filmed the shots depicting the front of the Von Trapp home. The back of the house scenes were filmed at the Schloss Leopoldskron (above), and the interior scenes were a set in Hollywood. For a quick stop, walk by here and take your photos! While this likely isn’t a big stop for the typical tourist, my mom is such a die-hard fan that we of course had to visit! Actually- I’m kidding. This isn’t where they really filmed the movie. In fact, I threw this one in here just to keep you all on your toes! We couldn’t find this place in Salzburg, so we just pretended to be the Von Trapp children (dressed in window curtains). If anyone knows where that row of trees is however, let me know in the comments! The Salzburg music festival is a centuries old tradition, and many of the events still take place in this 17th century rock quarry turned amphitheater. This is where they filmed the scene of the family singing in the music festival, right before making their theatrical escape from the Nazis. Fun fact: The real Von Trapp family escaped Austria by boarding a train in their back yard! High on a hill you can find the place where the nuns portrayed in the film actually live and pray: Nonnberg Abbey. While the movie set for the convent was created in Hollywood, this is the real location where Maria was a novitiate. 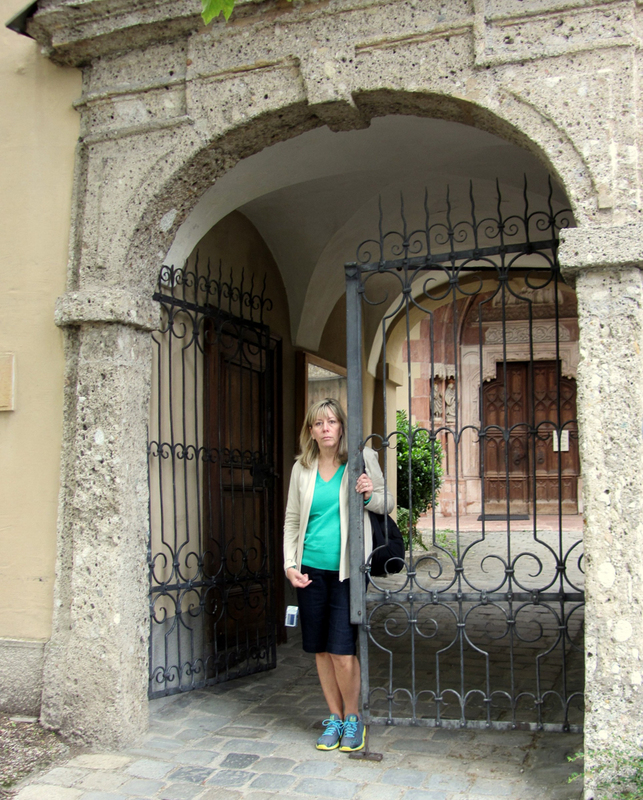 When we visited, we recognized the entry gate from the scene where the children visit and try to convince Maria to come back. 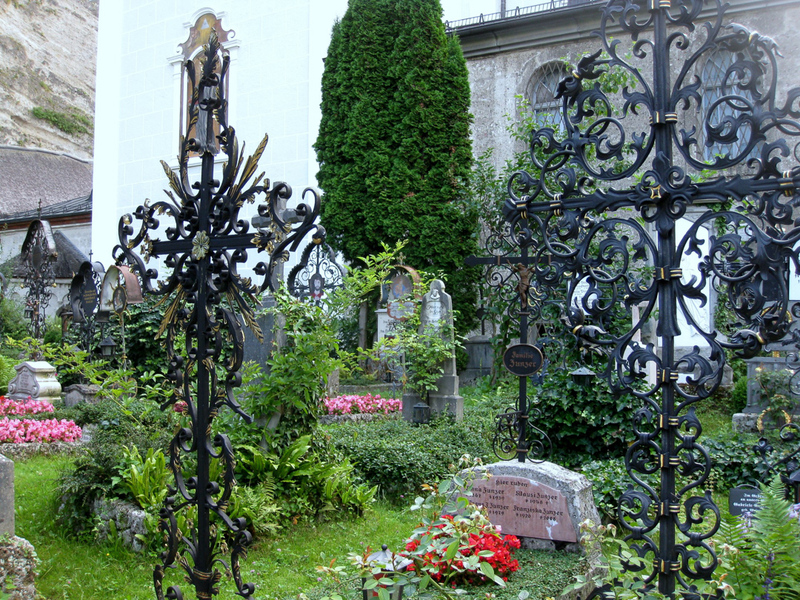 Nearby, you can also find St. Peter’s Cemetery. This location served as inspiration for the scene where the family hides behind the gates of a mausoleum. While the beginning portion of the famous “Do Re Mi” number is filmed in the center of the Old Town, the song reaches its peak at the lovely Mirabell Gardens. This is where you can find the fountains the children dance around- and of course the steps where the children hop at the end! While this is not the original gazebo where the iconic “I am Sixteen Going on Seventeen” scene was shot (it was filmed on a Hollywood set), this recreation was originally located at the Schloss Leopoldskron. After too many trespassers caused trouble over the years, it is now part of the Schloss Hellbrunn palace property. Head there to visit the beautiful palace, and find the gazebo in its gardens. 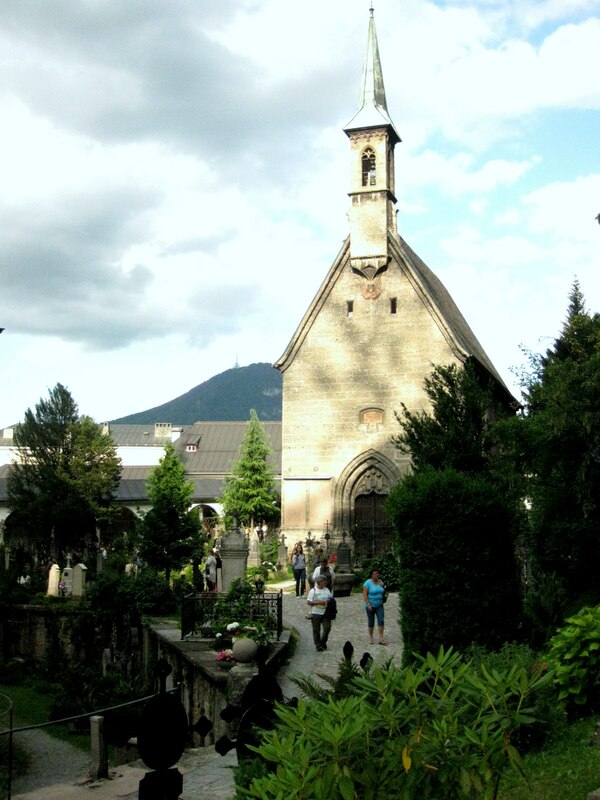 In true life, Maria married Captain Georg Von Trapp at the Nonnberg Abbey in central Salzburg. However, The Hollywood version of their wedding was filmed here. This is where the beautiful scene with aerial shots of Maria’s long wedding dress train are from. The town of Mondsee is only about 15 miles from Salzburg, and with its colorful and charming surroundings, it was a worthwhile trip! A stunning countryside town only thirty minutes from Salzburg, the mountain view from St. Gilgen is a must! Several of the introductory movie shots were filmed here, including the the iconic “The Hills are Alive” scene. Unfortunately, the exact hill is on private property, but you still get the feel of it! Most tourists don’t know this, but you can actually stay in the TRUE LIFE family home of the Von Trapps! This beautiful yellow mansion is now known as Villa Trapp, and is a \peaceful bed-and-breakfast located in a quiet suburb of Salzburg called Aigen. After the real Von Trapps fled Austria, this home was eventually taken over as an operations office for the Nazis. The infamous right hand man to Hitler, Heinrich Himmler, spent several months living here. Once the war ended, the mansion was then donated to local nuns. They blessed the home to rid it of the evil it had witnessed, and thankfully so! Over time, it was converted to the hotel and mini-museum that it is today. While staying there, we also realized there is a Nazi bunker in the backyard that soldiers constructed while stationed there. For some fascinating insight into the World War II era, I highly recommend a stay at this beautiful home! Finally, if you’d like to read more details about this remarkable family, check out “The Salzburg Book” here! While there are many more places in the city featured in the film, these are the ones we were able to visit and enjoy. So, before I say so long, farewell and auf wiedersehen to you- I should mention that when you leave Salzburg… you will hate to go and leave this pretty sight! As always, all reviews and opinions are my own. However, affiliate links are included and I may receive a small commission should you choose to purchase any of the hotels, tours, or products listed in this post. I can’t believe I’ve never actually watched the Sound of Music, it seems like a film everybody should have watched! It really does sound like you’ve had an amazing time in Salzburg due to your love of the film! I will definitely make an effort to watch it before I visit Salzburg! That’s why I suggest you always do your homework before you depart for a trip! Your mom was awesome to find a way to get you all near the Schloss Leopoldskron! Haha nope! The only Vienna connection is that the Father in the film goes there for business purposes but it’s not ever “on camera” . 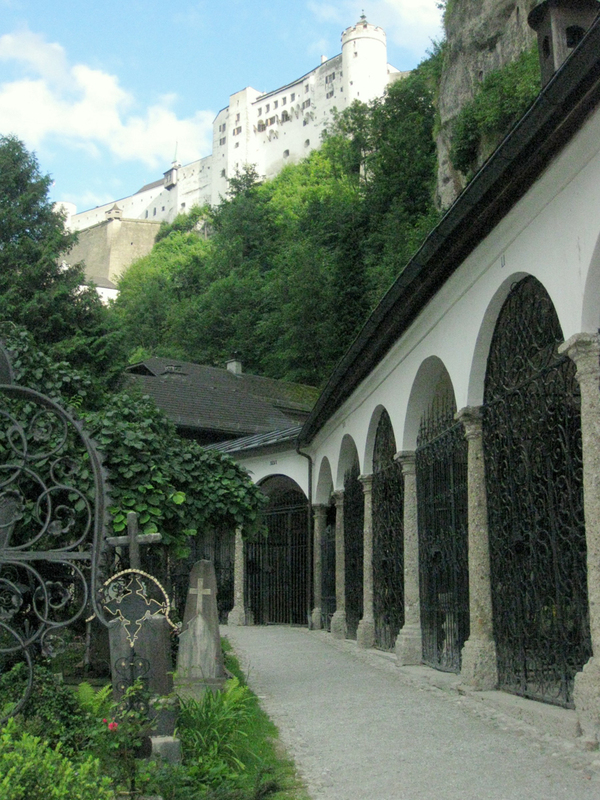 You will love Salzburg! Hopefully you can make it there! I love this article. Everything looks like the movie. I love how your mom did the research and found a way to get your private access to the Von Trapp estate. We always stress activity based travel and choosing your hotel to match your trip. This was a perfect example and quite a find. I imagine, even if the grounds are open, you might get benefits like extend touring hours or at least the proximity to be first in line. Lol ! I was also a fan of this film when I was a kid. Now I am not sure I would follow the Trapps’ steps in Salzburg but I would not mind checking the amphitheater, the abbey or the cute town. Your mother must be happy to have seen all these Trapp places with her own eyes ! I think you’d be surprised how much you would like it if you re-watch it again as an adult. I became even more interested when I read the story of the real family’s life in the auto-biography of one of the daughters, Agathe Von Trapp. Staying in their original home (with the Nazi bunker- yikes) was particularly fascinating, regardless of the film! We did this tour while in Salzburg. It was so much fun and it was filled with beautiful historic sights and vistas of the stunning countryside. As a Sound of Music fan, I loved recollecting my memories of the movie along the way. Such a lovely tour. I love the Sound of Music, but I never took the tour. It looks like so much fun. I would probably do it next time I happen to go to Salzburg. It’s such a gorgeous city, too. I’ve never been to Austria but it looks gorgeous! I especially like the shot of St. Gilgen. It’s such a beautiful little town! I would love to visit it myself. Great post! You’ve really covered all of the sights. 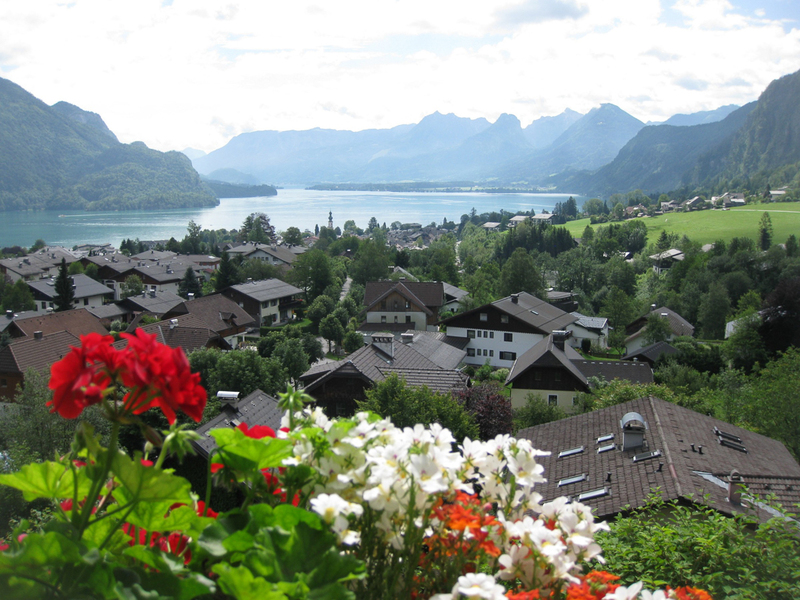 I was in Austria earlier this year on a cruise and wish I would have had time to cover all these sights—especially the town of Mondsee. It is stunning! Loved reading this post. The cult movie Sound of Music seemed to unfold before me as I was riveted to the text and pictures. 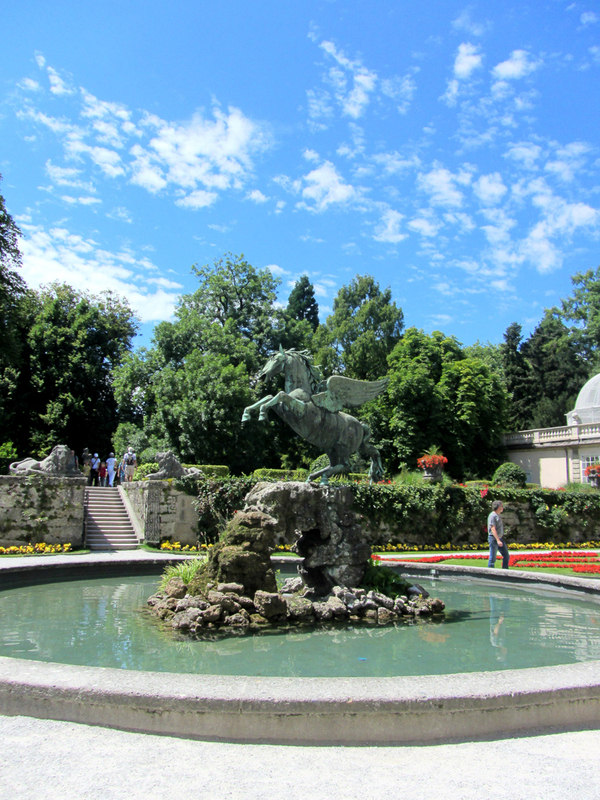 Salzburg is a place that we have been planning to visit and figures in a East Europe itinerary that we have drawn up. Hope the itinerary sees the light of day soon. Hey Michelle! Great itinerary! So I found out that the Schloss Hellbrunn (Hellbrunn Palace) is where the alley of trees was shot! Thank you so much Allyson! That’s where we were was right outside the palace, but we didn’t think that was really it- maybe it was!? Road of trees is actually near Mondsee. In a village St Lorenz but on the lake side. Cycle it often…..